A website is the utmost easiest, dependable and efficient method to reach out to your clients. It is the face of your business over the World Wide Web. It allows customers to find you rather than you going in hunt for them. Static Website is the easiest way to display your product or trade online. The static website is also known as small business websites and catalogue websites. It is mainly used for websites that will not involve frequent updates. It can also be used as a source of intermediation to establish contact with the clients. Dynamic web pages are the web pages that change dynamically. Dynamic web page alters itself every time they are loaded. Dynamic web pages can also modify their content based on what users do, like selecting certain text or an image. As the information kept in the database changes, the web page connected to the database change automatically without human involvement. Dynamic websites improves the prospects of image galleries, e-commerce websites etc. 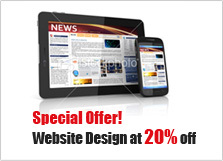 We convert your static website to a dynamic CMS enabled website. You provide us with your functional requirements and purposes. We create a basic Drupal, Joomla, or Wordpress website according to your requirements. You provide us with your functional requirements and purposes. We create a dynamic CMS website that will meet your needs.